The facility is located on U.S. Highway 36, 17 miles east of Byers. This is only 60 miles (and less than one hour) east of metropolitan Denver with numerous accommodations within 20 miles of the track. 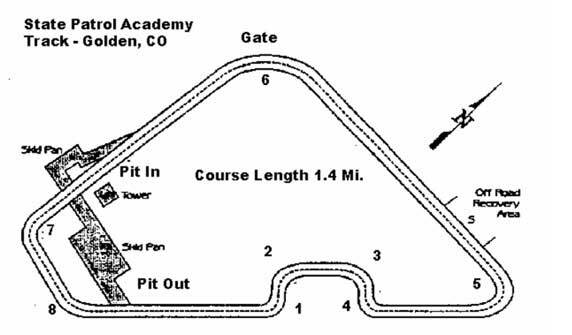 To reach the track, exit I-70 at Byers (exit #316) and then take Highway 36 due east for 17 miles. until the road becomes a divided highway. Take the first left (south), toward the Pueblo Reservoir Recreation Area. Proceed past the first light which is the other half of the divided highway. yards to the fork in the road and bear left. Follow the road for a few miles to the track entrance. Take I-25 south to Pueblo. Exit onto Highway 50 east and proceed to the town of LaJunta. a large sign for the airport and a small LaJunta Raceway sign). and follow this road as it bends left and delivers you to the track entrance. The Colorado State Patrol driving track on top of South Table Mountain was built in 1972 and has been used by numerous police agencies around the state. The track is approximately 1.4 miles long with several curves of variable speed and grade. The course was designed to simulate a two-lane highway. Take I-70 West to Exit 263, Denver West Blvd. Exit and turn left over I-70 to the second traffic light. Turn right onto West Colfax and drive .6 miles to the traffic light at Indiana. Turn right and follow Indiana merging into S. Golden Rd. Proceed 1.2 miles to Quaker St. (there is a 7-11 at the corner of Quaker and S. Golden Rd.) Turn right at the light at Quaker St. and proceed through the gate where the pavement ends. Go up the hill to the track. Pass the first gate on the right with the big blue sign. Enter at the second gate on the right. Directions from Boulder: Take CO 93 south from Boulder. CO 93 becomes US-6/W.6th. Ave. Turn left onto 19th. St. Turn right onto Jackson St. Enter the next roundabout. Pass Golden High School on the right and stay straight to go onto S. Golden Rd. Pass through 4 roundabouts. Turn left at the light at Quaker St. (there is a 7-11 at the corner of Quaker and S. Golden Rd.) Proceed through the gate where the pavement ends. Follow the above directions up the hill to the track. For a GPS use this address: 2054 Quaker St. Golden, CO (this address is on the big blue sign). Take Quaker St. through the gate where the pavement ends and follow the above directions up the hill to the second gate on the right and into the track.